If you're using the Calxa Online browser app, please refer to the Cashflow Statement and Cashflow Statement (Indirect) Report help notes. The Statement of Cashflows report is a standard financial statement. It shows how changes in net profit and balance sheet accounts affect cashflow. This analysis is displayed by operating, investing and financing activities. However, this report cannot just be run out of the box, as it does require some configuration before it can run efficiently. This help note will provide a description of the report and highlight the best approach to prepare a Statement of Cashflows in Calxa. The instructions and advice herein is provided as a guide only, so please refer to the relevant accounting standards in your country. Operating Activities are the principal-revenue producing activities of the organisation. Since most Profit and Loss accounts are categorised as Operating Activities, it is common for this category to be calculated starting with Net Profit, and then the Non-Operating Activities are adjusted out. Non-Operating Activities include Non-Cash accounts like depreciation. Finally, there is an adjustment for balance sheet movements, such as Current Assets or Current Liabilities like Debtors and Creditors. This is referred to as the Indirect Method, and is the method used by Calxa in calculating this report. Investing Activities represent the acquisition and disposal of long-term assets or other long term investments. Purchasing or selling property, plant and equipment or intangibles would be classified as Investing. Financing Activities represent transactions that result in changes in the size and contribution of capital and borrowings. Examples of financing activities include changes in equity related to shares, or changes in liabilities related to long term borrowings. If you have a good understanding of Calxa features like Account Trees and the theory behind the Statement of Cashflows report, the above steps should serve as a simple guide, however a detailed explanation of each step is shown below. Since the report allocates cashflows as Operating, Investing or Financing and excludes non cash accounts, you are required to categorise your chart of accounts accordingly. To do this, click the Statement of Cashflows button in the Financial Settings section of the main ribbon. As a first step you may wish to use the Restore Default button. This will split your chart of accounts into the report categories. Defaults should be considered an initial guide only – further review and care must be taken to categorise the accounts. Non-Cash Accounts = (Accounts with a Cashflow Type of None) – Superannuation Expense – Trade Debtors – Trade Creditors. Note: Default account nominations for Bank, Current Year Earnings and Retained Earnings are all excluded from the Statement of Cashflows nominations. To edit the nominations select an account and then use the Move selected to drop down button to nominate a new category. Multiple accounts can be selected at the same time by holding the Ctrl key while selecting the accounts. Alternatively, a range of accounts can be selected at the same time by holding the Shift key and selecting the first and last account in the range. When you have finished editing click Save to save your changes. First up I want to explain the difference between Non-Cash Accounts for the Statement of Cashflows and the Cashflow Type of None for the purpose of Cashflow Forecasting. These are nominated separately because they hold separate meaning, and in some cases accounts with a Cashflow Type of None should not be considered a Non-Cash Account for the Statement of Cashflows. For example when you nominate Superannuation Expense and Superannuation Payable in the Default Accounts screen this sets the Cashflow Type to None on the expense and Schedule on the liability. The cashflow type of None in this case does not imply that superannuation expense is a Non-Cash activity, it just implies that the timing of the expense needs to be adjusted. For the Statement of Cashflows, Superannuation is an expense derived from principal-revenue producing activities so would be considered an Operating Account. As such both the Superannuation Expense and Superannuation Payable should be nominated as Operating Accounts. The combined movement on these accounts will account for the cashflows from Operating Activities. Now to understand why we need to balance the Non-Cash Accounts. 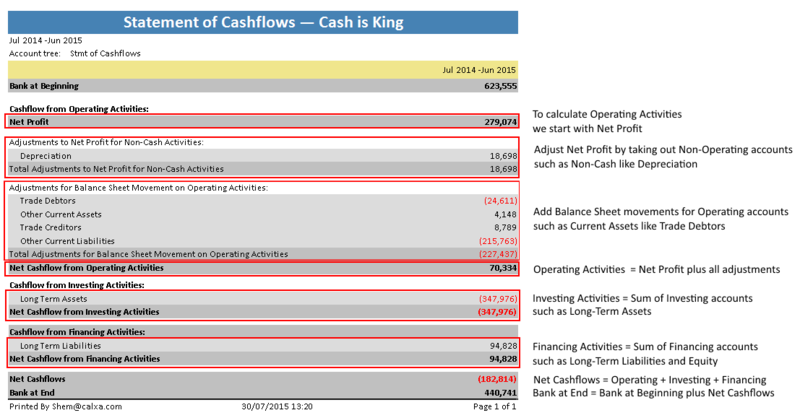 Since this report identifies cashflows, Non-Cash accounts will either not be included or adjusted out of the report. For the accounting equation to hold true in this report, Debits must equal Credits. With all the accounts included in the report we know it balances, but if we start removing accounts then we must make sure the accounts we remove have equal debits and credits. Put simply, if the sum of the Non-Cash accounts do not balance to zero the net cashflows will not balance with the opening and closing bank. Balancing the Non-Cash Accounts is generally a case of ensuring each account has a matching pair. For example, Depreciation Expense should have a matching Accumulated Depreciation account nominated. Carefully review your Non-Cash activities and ensure each account has the matching account that will keep the group balanced. Note: Coming Soon - A discrepancy report that includes Non-Cash accounts to help identify discrepancies. Traditionally the Statement of Cashflows report is a summary level report that does not show the full detail of your chart of accounts. 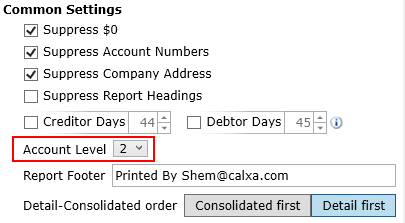 Calxa will be showing your full chart of accounts in this report, just broken up and split into the relevant categories. The Account Level in the report criteria can be used to show or hide detail, however you may also wish to create an Account Tree with custom groupings such as Depreciation Expense, Payments on Long-Term Loans, Sale of Land, Purchase of Equipment, Dividends on Shares or any other sections that may help to summarise and make the report more readable. Please refer to the help article on Account Trees for help with creating an Account Tree. In the example report above we used an account tree with very simple groupings such as Trade Creditors, Other Current Liabilities and Long-Term Liabilities. 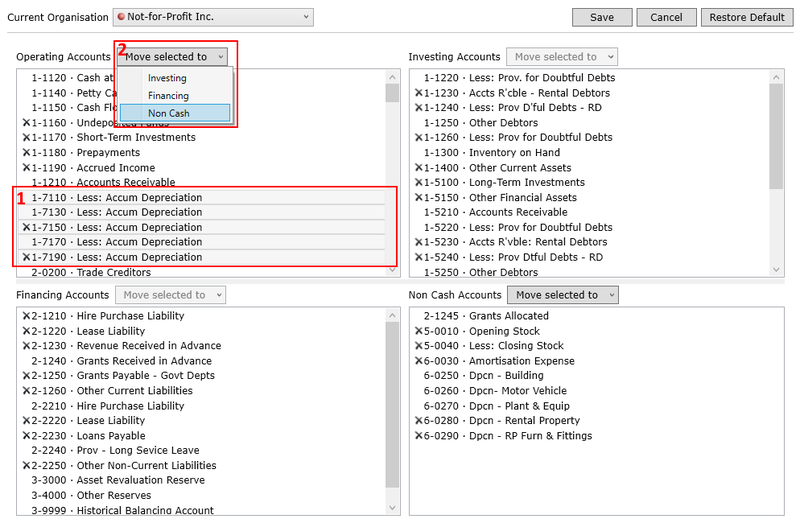 The Liabilities section of the Account Tree in this example is shown below. Now that the prep work is done, you should be able to confidently run the Statement of Cashflows report time and time again. Click on Reports in the Analysis section of the main ribbon. Select Statement of Cashflows from the Financial Statements reports list & Configure the report criteria including the Organisation, Account Tree and Date range. To run a report that summarises at the first level of your Account Tree set the Account Level under Common Settings to 2. Note: Level 1 accounts are the account type headers like Income and Expense. Level 1 accounts are hidden from this report unless you run the report at level 1, in which case Operating, Investing and Financing activities are just shown as a breakdown break down of account type. Click Display report and be sure to check the discrepancy row to ensure the report is accurate. If your report has a Discrepancy row between Net Cashflows and Bank at End then this is an indication that the Non-Cash Account nominations do not balance. Please refer to Step 2 – Ensure Non-Cash Accounts are Balanced.